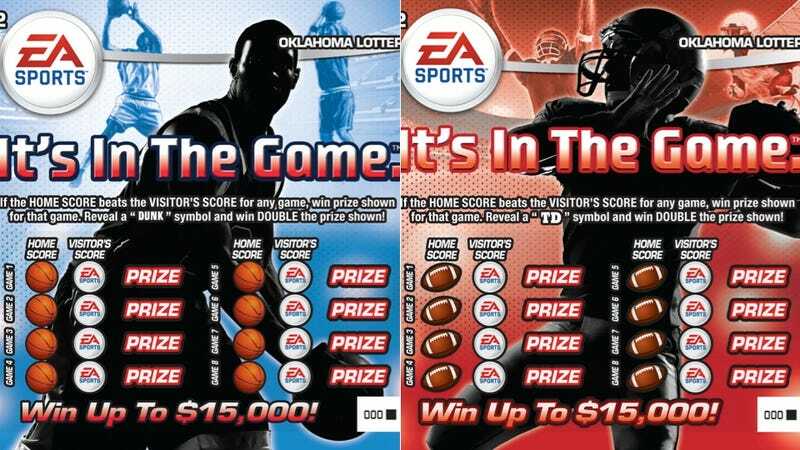 You can't buy a cold six-pack* in Oklahoma, but next time you're at the likker store for a carton of Parliaments and a fifth of Evan Williams you can buy some EA Sports-branded lottery scratch cards. The Oklahoma Lottery teamed up with the sports video games label for the lottery's latest sports-themed scratcher, seen above. The usual instant-win money prize is offered, with video games, consoles and "one-of-a-kind experiential prizes," according to a news release, which makes it sound like EA is branding lotto cards in more states than just Oklahoma. "We are pumped to be the first state to launch EA SPORTS theme lottery games," said Jay Finks, Marketing Director for the Oklahoma Lottery. "We have been looking for a brand that will appeal to core Lottery player sports fans but also has a propensity for attracting younger adult players to the category as well. We believe that EA Sports helps us achieve this objective." Football-themed scratchers are available now; basketball tickets will release in November. * Of anything stronger than 3.2 beer.